The Augusta Museum of History is pleased to offer a series of in-depth presentations on this area's efforts during World War I. Stretching back to the Revolutionary War, the Fall line of the Savannah River has provided the military with an ideal place to train and manufacture arms. The project aims to bring members of the veteran community, in particular, together with the general public in libraries and museums around the country to explore the transformative impact of the First World War. Providing scholar-moderated opportunities for those who served in more recent conﬂicts in Korea, Vietnam, Iraq, and Afghanistan to bring their experiences to bear on historical events and texts, the project will illuminate for a wide audience the lasting legacies of World War I, and the similarities and diﬀerences between past and present. Dr. Lee Ann Caldwell, Director of the Center for the Study of Georgia History and University Historian of Augusta University will facilitate this session. Three veterans, Tom Sutherland, Kathleen Barnhart and Christine Betts, will read passages from WWI writers and writings. 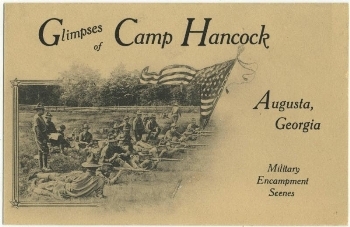 Topics will highlight Camp Hancock, Barnes Field, and individuals from the River Region involved in WWI. This session will be conducted by Steve Rauch, who is a retired Army Ordinance officer and currently serves as the U.S. Army Signal Corp historian at Fort Gordon. Amy Schaffman, the Museum's Education Manager, will introduce both children and adults to the Museum's vast collection relating to World War I. This will include using reproductions and providing tours of the Museum's permanent exhibition galleries focusing on Augusta's military ties. Tours will be led by Lt. Col Tom Sutherland (US Army Ret. ), who served in Special Forces, 82nd Airborne, Big Red One, Signal Brigade and served two tours in Vietnam. The program is part of the World War I and America, a two-year national initiative of The Library of America presented in partnership with the Gilder Lehrman Institute of American History, the National World War I Museum and Memorial, and other organizations, with generous support from the National Endowment for the Humanities.